Is there someone, somewhere, at the bottom of an arctic fissure or locked in some Saharan tomb perhaps, who doesn’t want to be famous? Is there anyone, anywhere who would reject that golden patina of deification, that rocket ride to the ranks of those who are judged by their peers to be better in some way than the hordes who spend entire lives without ever getting their names in the paper, without ever being photographed or spoken about? Without, in short, ever displaying their deeds or talent or personality on a canvas broader than that of their own living room carpet? There are the naysayers, of course, the apologists for a quiet life who do not wish to be stopped on the street or pointed at, who shudder and proclaim, after thumbing through the latest issue of their favourite gossip rag, how awful it must be to suffer the public intrusions foisted on the Brads and Anges of this world. But really? Really? Is there not in the breasts of these poor souls some spark of envy? Would they really sidestep a torrent of collective love if it were directed their way? Would they really reject the accompanying money or eschew that most coveted of fame’s other perks: exponentially expanded sexual opportunity? Well, maybe. Maybe our media-fuelled, covetous, venal, emotionally bankrupt society has not yet been able to entirely rid itself of the cancer of sanity. Because, for better or for worse, human beings are hardwired for fame, both in their need to bestow it on others and in their desire to find it for themselves. We need it in the same way we need religion. We need it to take us outside ourselves. We need it to believe, in our dark despairing days at the office or the factory, that life has more in store for us than 40 years of routine and mediocrity. And, of course, we need it to revile, to provide us with totems at which we can hurl the rocks of our own inferiorities and discontents. I mean, who are these Hollywood assholes anyway? Each of us, if we are truthful, is born with a sense that we are special, that we are somehow better than the other poor slobs around us. We grow up believing we are destined for greatness. But what the source of this greatness is, what trait or characteristic ratifies our belief in our own importance, is something that very few of us ever succeed in identifying concretely. Instead, we wander the pathways of our lives suffused in an amorphous glow of significance while never actually managing to manifest the adamantine destiny we are so certain of. We wait, continually, for meaning to be ascribed to us. But the longer we spend in life’s waiting rooms the more anxious we get, the more frequent the late-night misgivings, and the greater our propensity, in unguarded moments, to question our ability to separate ourselves from the jostling masses with which we compete every day. And it is exactly this often-thwarted desire for some sense of meaningful individuality that drives us to set others upon pedestals. If they can be promoted by a consensus of opinion (however imperfect that consensus may be) to a position where they are known about by large numbers of people and believed to be better in some way than everyone else – in essence the definition of fame – then surely there is a chance it could happen to us. We bestow the mantle of fame not, in this sense, to reward those who receive it, but to bury the treacherous voice that whispers to us through desperate 3 a.m. nights, hinting at the possibility of our own worthlessness. And if we are among the lucky who do achieve fame for ourselves? Then it is the most visible proof that we are indeed, as we always suspected, special. Our psychological quirks, of course, are not the only factor that shapes the fame landscape. Not today. The proliferation over the last 20 years of gossip magazines, Internet sites and TV channels all dedicated to the twin, and happily symbiotic, aims of promoting the product of giant media conglomerates and feeding our hunger for celebrity news has changed the face of fame. The famous are more famous than ever before. There are more of them, and we know more about them than at any other time in history. As individual media properties become aggregated under the ownership of a handful of gargantuan umbrella companies, information sharing and economies of scale mean a juicy titbit of gossip, that might previously have been confined to the back pages of a single, locally circulated print periodical, can be tweaked, edited, reformatted and pushed out into the world through thousands of different outlets. Changes in technology, too, have played a profound role in the magnification of fame. From the nineties onwards, the skyrocketing penetration of the Internet has made it possible for even cottage-industry sites to reach a global audience. And if some of these sites pay scant attention to the truth, if they rip second-hand, unauthenticated stories from similarly dubious sources, so what? In most cases it doesn’t matter. What matters is that the fame mill keeps turning, that faces are sprayed across screens, names are trumpeted and actions, whatever their level of inanity, are breathlessly reported. But what has this explosion of coverage done? What has happened to fame? Like some ever-expanding soufflé there is more and more of it, but there is also less substance to it. Think back…. Until the early 20th Century, who were the recipients of peer adulation? For what reasons were certain people granted entry to the halls of cultural iconography? One thing’s for sure, a hundred years ago not many people were hoisted onto society’s shoulders for adopting a baby, conducting a domestic dispute in public or producing some form of vacuous, emotionally manipulative entertainment. No, the people we used to revere were the people who enriched society – genius politicians, explorers who opened up new lands, medical pioneers, scientists, great composers and musicians, writers who cast light on the human condition, consummate actors who were actually masters of their craft, even courageous military leaders have, in the past, had their time in the celebrity sun. Some of these luminaries still receive a measure of adulation today, of course, but is it really the cancer researcher or the clear-sighted politician who can be said to be the contemporary face of fame? Certainly not as far as the gossip magazines, the Hollywood exposé sites or the entertainment news channels are concerned. No, these arbiters of public taste believe entry to celebrity heaven should be reserved, almost exclusively, for personalities – that is, for those who simply glitter brightly enough to attract the attention of those whose lives are not similarly incandescent. It does not matter whether these chosen ones fail in many cases to enrich the cultural lexicon or contribute anything meaningful to society at all. All that matters is that they keep people turning the pages. But we love Kim and Paris and Lindsay, cry the customers of News Corp., Bertelsmann, Viacom et. al. They make us happy. They deserve to be famous! Fair comment. Climbing to the top of the personality ladder takes a lot of guts, determination and perseverance, and clawing your way from obscurity to international recognition is an achievement worthy of praise and comment. But is it really worth a level of fame that only a few decades ago was reserved for monarchs and the highest echelons of the film industry? It would not matter so much, perhaps, that fame today seems perpetuated by the endless replication of fashion choices, marital tiffs, childrearing banalities, and the prurient machinations of partner hopping if such interesting trivialities had grown from an original foundation of real talent. But talent is an elusive and inconsistently occurring ingredient. Some of the famous have it in spades, and some… don’t. And yet many in these two camps are just as famous as each other. This is what fame has become today. An unevenly applied and overused reward that can no longer be used to gauge meaningful achievement. About the only constant that can be found among today’s overly purveyed celebrities, talented and untalented alike, is the desire for a greater share of attention than the rest of us are content to get by with. In essence, many are famous simply because they wanted it badly enough. Who is to blame for this debasing of a once-precious commodity? Those stars who make penetration of their domestic lives so easy must bear at least some measure of responsibility for the drivel written about them. Why do we see so much of Brad but, comparatively, so little of Tom? It’s hard not to think that there’s an element of choice at work here. And the media companies themselves, of course, wear a target ten stories high. They fill pages and pixels with the dross they think we want to see, and in their desperate need for content they ensure further degradation in the quality of fame by resorting to the crack cocaine of programming – reality TV. Cheap to produce and fast acting, reality TV delivers an addictive voyeuristic hit that lasts and lasts. The downside? It makes stars of people who, arguably, have no right to fame at all. But, depressingly, there is another, equally culpable player in this game – ourselves. In the early days of silent films, studio bosses, attempting to limit star salaries, refused to allow on-screen billing for the actors who performed in their movies. The public, faced with this enforced anonymity, applied their own titles to their silver screen favourites by referencing the names of the companies who produced the films – the Biograph Girl, the Kalem Girl, the Vitagraph Girl etc. By 1910, however, when average weekly cinema attendance in the US hit 26 million, a tipping point was reached. 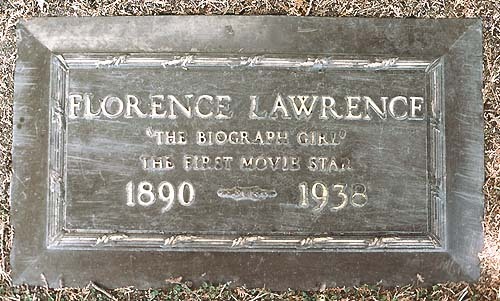 The weight of the public’s idolatry, their collective yearning to ascribe fame more personally, enabled Florence Lawrence, then the current Biograph Girl, to demand and get, during a move to the competing IMP film company, the first-ever marquee billing for a movie star. Though, no doubt, a personal triumph for the 24-year old Florence, this act, made possible only by a public desperate to transpose their own desire for meaning onto someone who had, seemingly, already achieved it, opened the floodgates to both the spiralling star paychecks that now strangle the film industry and to the glut of celebrity debris that has so undermined and obscured the notion of fame. If it is a basic economic axiom that there is no supply without demand, then our continued demand for, and acceptance of, the pap we are fed about the individuals we so adore, is just as much to blame for the insipid, ersatz version of 21st Century fame as the antics of the stars themselves and the complicit panderings of the media outlets. And the longer we keep logging on, tuning in and buying this garbage, the worse it’s going to get. Does it really matter? Is it really worth tying oneself in knots over the inanities of the celebrity sausage factory? Well, consider this: if fame is a reflection of a collective desire for meaning, then the quality of fame in a society may well reflect how much or how little value we place on ourselves. Matthew Stokoe was born in England and is currently living in the Southern Hemisphere. He is the author of three novels: Cows, High Life, and Empty Mile. His new novel is called Colony of Whores.